A rare celestial treat will colour the skies on Januay 31,2018, when a Blue Moon, a total lunar eclipse and a supermoon all rolled into one. NASA has even dubbed the event a "Super Blue Blood Moon," as it will occur near when the moon is at its closest point to Earth, a so-called "supermoon." There hasn’t been a triple lineup like this since 1982 and the next won’t occur until 2037. The first event is a total lunar eclipse that happens on the morning of Jan. 31. This eclipse will be special! The moon will be both "super" and "blue," and if skies are clear, skywatchers in North America will be able to see all or part of the eclipse. Blue Moon occur when two full moons happen in the same calendar month; blood moon occur when the moon passes into Earth's shadow; and supermoon happen when the moon's perigee — its closest approach to Earth in a single orbit — coincides with a full moon. In this case, the supermoon also happens to be the day of the lunar eclipse. According to Space.com, best place to see it will be in central and eastern Asia, Indonesia, New Zealand and Australia. During a total lunar eclipse, though the Moon gets shadowed by the Earth, sunlight passing through the Earth’s atmosphere, break down in its constituent colours and the red part gets scattered by the atmosphere and falls on the Moon's surface, thereby making it take on a reddish copper hue. That’s why a totally eclipsed Moon is called a “Blood Moon”, as the colour of the Moon looks blackish-red. A lunar eclipse can only happen at full moon. Only then is it possible for the moon to be directly opposite the sun in our sky, and to pass into the Earth’s dark umbral shadow. Most of the time, however, the full moon eludes the Earth’s shadow by swinging to the north of it, or south of it. For instance, the last full moon on January 2, 2018, swung south of the Earth’s shadow. The next full moon – on March 2, 2018 – will swing north of the Earth’s shadow. A super moon usually takes place every one to two years, when the full moon coincides with its closest approach during its monthly orbit to Earth. Because the moon has an elliptical orbit, one side - called the perigee - is about 48,280 km (30,000 miles) closer to Earth than the other side (the apogee). The term was coined by astrologer Richard Nolle in 1979. During the phenomenon, the full moon appears about 14 percent and 30 percent brighter that it would during regular full moons. When this Earth-Moon-Sun system occurs with the perigee side of the moon facing us, and the moon happens to be on the opposite side of Earth from the sun, causes the moon to appear much bigger and brighter in our sky than usual, and it's referred to as a supermoon - or more technically, a perigee moon. Usually full moon happens approximately once a month, or every 29.5 days.A blue moon normally occurs about once every two and a half years. This month’s first full moon was on 1 January. A Moon that actually looks blue, however, is a very rare sight. The Moon, full or any other phrase, can appear blue when the atmosphere is filled with dust or smoke particles of a certain size; slightly wider than 0.7 micron. The particles scatter the red light, making the Moon appear blue. This is known as Mie scattering, and can happen for instance after a dust storm, a forest fire, or a volcanic eruption. 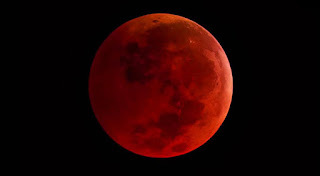 Interestingly, while you search about “Super blood blue Moon,” in internet, you may see that it is happening after 152 years and the last time it happened was in March 31,1866. But this is true only for the Americas, not for everywhere on the globe. In Asia, the last Blue Moon and total lunar eclipse happened on December 30, 1982. The moon is one of the most amazing objects in our solar system, and it had often helped us study our solar system. Total eclipses of the Moon are spectacular events and are easy to see with the naked eye. NASA scientists say the way the moon's surface responds during the eclipse can provide insights about where to land a rover for a future mission.